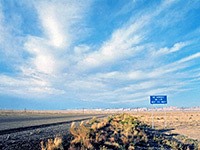 East of the Fishlake Mountains, I-70 cuts across one of the emptiest and least developed regions of Utah - a wide plateau crossed by two entrenched river systems and surrounded by a ring of upturned strata. This is the San Rafael Swell - arid, little vegetated yet often very scenic, with mesas, cliffs, buttes, springs and especially canyons; these are sometimes wide with stepped sides but often narrow and slot-like. Most is owned by the BLM and could well be a future national monument; for now though the land is open and access is unrestricted. 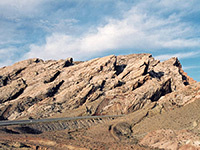 The Swell is an oval shaped uplifted area of layered rocks - geologically termed an anticline - about 75 by 40 miles in extent, most of which has been eroded away forming the mostly flat central plateau, while the strata at the edges are left exposed and angled near vertically (the San Rafael Reef); here are found most of the spectacular canyons, especially in the southeast section. The largest town nearby is Green River, 18 miles east of the reef on I-70; this is also a convenient base from which to explore the Canyonlands region to the southeast and Desolation Canyon to the north. The town has a selection of shops and cheap motels, and the John Wesley Powell River Museum - besides its interesting exhibits this has a good selection of local books and topographic maps. UT 24 and its side roads give access to the southern swell, and along here is found Goblin Valley State Park, the most visited site in this area. 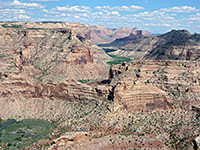 The northern half falls between US 191/6 and UT 10 and amongst the routes heading inwards is the unpaved but good quality Buckhorn Draw Road which leads to the single most impressive viewpoint - the Wedge Overlook from where many square miles of eroded canyons around the San Rafael River are viewable. principally for uranium (most intensively around the Temple Mountain area) but also for small amounts of copper, silver, oil and gas; otherwise, ranching has been and continues to be the only major use of the land. Herds of wild horses and burros roam the plains, and bighorn sheep may sometimes be spotted in the canyons. Most of the tracks across the swell result from prospectors in the early to mid twentieth century, and these provided the only access until 1972, when the interstate was constructed, dividing the region in two. Various exits now allow easy entrance to the middle section and link with the old tracks, most of which are good for regular vehicles and quite well signposted. Hiking and exploring are the main reasons to visit nowadays - there are trails to mountains, historic sites, old mines and the numerous canyons - these offer experiences ranging from extended, strenuous trips like the hike through the Black Boxes of the San Rafael River to easy walks such as that down Little Wild Horse Canyon. - a good alternative to staying at the Goblin Valley campground, where the fees (2019) are $30 a night. The road becomes unpaved but still fine for all vehicles as it follows the canyon of South Temple Wash into the reef, where multicolored walls of Wingate sandstone rise up to 500 feet. 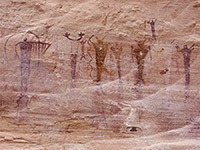 Two sections of the cliffs on the north side have quite impressive pictograph panels, though mixed with modern graffiti. The cliffs recede on the far side of the reef to reveal an angular landscape of numerous red ridges, ravines and cliffs, with a prominent peak to the north. 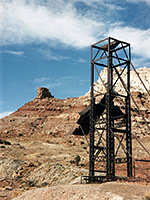 This is Temple Mountain - site of one of the main mining areas in the Swell, it was in use from 1910 to about 1960, extracting large amounts of uranium ore from strata of the Chinle formation. Many shafts, stone buildings, spoil heaps, rusty iron equipment and other debris remain in place, plus a large winch tower, and a walk around the mountain on old mine roads makes for an interesting hike of 2 hours or so. The rocky badlands beneath the mountain are also strewn with many pieces of petrified wood, the Chinle sandstone being the same formation as found in Arizona's Petrified Forest National Park. The old tracks branch off the main road at the site of Temple Mountain village, a settlement that was built to service the miners and once included a gas station and general store, though little trace remains today. The nearest towns with hotels close to the San Rafael Swell are Green River in the east, Torrey in the southwest and Price to the north.